Hostinger are amazing when it comes to the support services. The whole team is very helpful and friendly, always there for me when I need them. This hosting is what I've searched for all this time! Easy to use, cheap and on top of all, the support is really helpful. You know what? I'm a beginner to this world and they help me when I'm star ting to get lost. They won't let me to face all difficulties. They're freaking awesome! The service provided by Hostinger is not something I would call perfect but it is still up there. The site is reliable, has a good uptime, I will give them that. After trying to post top rated providers, being fed up with their slow response and client neglection, I finally found a company that actually cares. Never do I post reviews, but this time is different. Thank you for your services, I know now that my website is in great hands with a team of professionals who are always here to help. Hostinger is good only for beginners. If you are a web developer or a business looking for online presence then this is not the right choice. Thier servers cannot handle loads. Wordpress sites often go down and email service is pathetic. Customer support is not great.Though they provide chat support, they reply very late. If they are not able to provide proper resolution then they blame their System Administrators. Hostinger, for my surprise, turned out to be my favorite hosting provider. I'm not new to this so understand perfectly that essential features are loading time, uptime and support. They deliver on all of them. I rarely need assistance, but when I need it, I need it quickly. After trying out their live chat system from the cpanel I can tell that they work very quickly and very professionally. In all this time I experienced some downtime, but nothing major, so couldn't say that it's an issue. One of the best Shared Hosting experience. I love the Cpanel design. Every one uses old pretty boring desing. But hostinger has redesigned Cpanel. The staff at Hostinger treat their customers really well. I have been using their shared server and the experience has been awesome for me. I would recommend them. The support team of Hostinger is great and they are of huge help when it comes to solving problems and providing web solutions. I am really happy with their services and would recommend it to everyone. Hostinger is a good web hosting service provider which you can consider if you're looking for a new web host. I migrated to Hostinger 10 months ago, and I am really satisfied with their services. Hostinger is establishing itself as one of the fastest growing hosting companies in the world. Their reach is expanding every upcoming day as more and more customers are getting attracted towards its high-quality hosting service. As of now, the only downside of the company is that it does not provide dedicated hosting services to the users. On the other hand, people have had some issues with the basic plans of individual hosting services as well. Though, on an overall basis, Hostinger offers many productive features to users in addition to the excellent technical support that ensures that customer’s website stays away from any kind of downtime issues. With the services and offers made available, the web hosting service provider known as ‘Hostinger’ is worth checking out. They are mainly focused on the cheap web hosting provided at a very high speed. Hostinger tends to be one of the most reliable sources in this industry at an affordable rate. In addition to the shared hosting, they also offer VPS and cloud hosting at a good monthly rate. This review will cover all essential features, pros, and cons, as well as the facilities provided by Hostinger. Hostinger quickly manages to provide a healthy environment to their users stopping them from making any shift. The company started back in 2004 and had successfully managed itself to get regarded as one of the best in the world. Currently, their services are spread out in more than 175 countries in the world with over 29 Million happy subscribers. According to the website claim, almost 15000 users join them every day. Hostinger leaves a good first impression in the shared web hosting for their new customers. They offer three different plans for shared web hosting, each coming up with 30 days free trial. The plans they offer are Single Web Hosting, Premium Web Hosting, and Business web hosting. This allows the users to select a plan according to their preferences and interests. Also, the added incentive of 30 days free trial is the icing on the cake. The users can try one, and if it fits them, they can go for the annual or monthly subscription as per their pockets. Though, the plans are affordable and come with handy prices. Furthermore, Hostinger comes with 99.99% uptime guarantee for all premium and web hosting plans. Also, if you are not happy with their service, you can just ask for a refund without answering or providing a reason for such. They easily land in the top ten of the best cloud web hosting providers in the world at present. They are actively preparing a next generation cloud web hosting platform which combines the best elements of VPS & Linux plans at once. The web hosting providing believes in not relying on a single server. Therefore, keeping the needs of their users in mind, multiple copies of website files are hosted at a given time. The web hosting data centers are loaded with balanced software composition directing traffic to the servers with some quick responses. This composition of the web hosting structure provides better data security for the websites in case of any hardware failure. Also, the prices charged are reasonable as the plans start ranging from $4.95. To keep their consumers satisfied, Hostinger comes up with six different plans for VPS web hosting. These plans are named as VPS Server Plan 1 to VPS Server Plan 6 in a serial order. You can start your web hosting for the website with a genuine rate of $4.95 per month coming up with various scalability resources, full SSH root, cloud infrastructure, and dedicated server space. In comparison to others, the speed offered by the VPS Plans is 30 times faster. The VPS plans offered to come with 100MBPS speed and support up to 160 GB disk space. Also, it provides 6000GB bandwidth which is more than enough for any person whether freelancer, beginner or any global company. Hostinger gives 99.99% uptime guarantee with the policy of 30 days cash back. Without any shadow of a doubt, Hostinger is one of the most reliable sources for web hosting. Even with such a low price, they manage to provide the best experience to their customers. They give a 99.99% Uptime guarantee to the users, hence, adding confidence in them that they won’t have any trouble while hosting their websites. Like the standard features of other web hosting providers, Hostinger comes with a 99.99% Uptime guarantee. Also, the first month of the service is a free trial for every plan they offer. So, if you are not satisfied with the services of Hostinger, you can opt for a refund. As per their 100% return-back guarantee, no questions needed to answer. If you go for Hostinger, you will get a 24-hour support with a guarantee of 99.99% uptime. Also, the technical support team of Hostinger is well dedicated to their work and know what they are doing. The staff is specialized in their particular field giving the best guidance in the time of any difficulty. They tend to solve any issue within few minutes. Hostinger markets themselves as the ‘cheap web hosting provider.’ Therefore, it is a well-known fact that the services offered are coming at a very reasonable rate. Their plans are easily affordable even for the beginners or those at the rookie level. 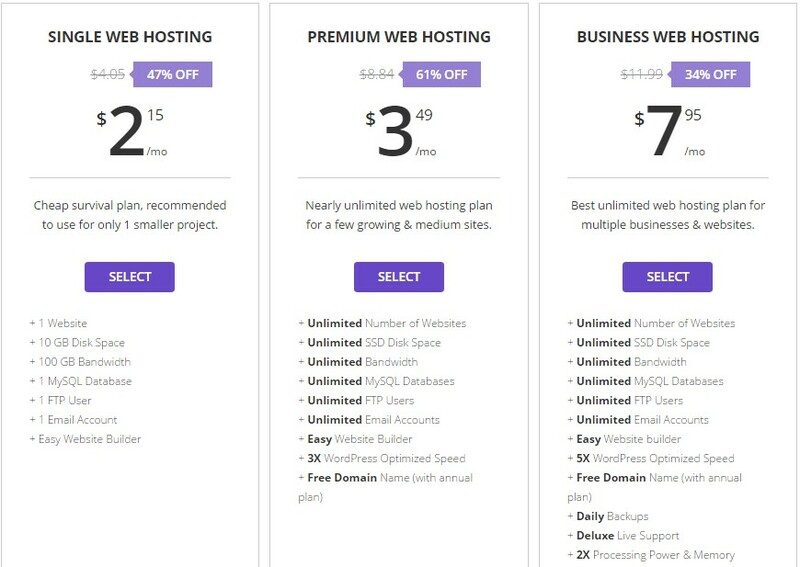 The shared web hosting plans start at just $2.15 per month. VPS solutions also come at a meager price of $4.95 per month. Hostinger comes with some top-notch web hosting features of all time. In comparison to the price charged by Hostinger, their features are tremendous. They compete with some highly expensive web hosting providers in the matter of hosting features. The features include free registration coming up with a free domain name. On most hosting platforms, you will enjoy the benefits of solid state drives with the minimum of 10 GB Disk Space. You can switch from a shared web hosting plan to VPS hosting powered by a cloud hosting platform. The cloud hosting provides the flexibility to grow in the near future which is perfect for beginners. Hostinger is one of the most famous web hosting service providers in the business. The company was founded back in 2004 and are enjoying an entertaining ride since then. The simple idea behind the concept of Hostinger is to let the users create a website for free of cost. Also, let them enjoy the benefits of unlimited PHP, MySQL, c-panel, and an ad-free experience. They believe in providing an independent chance to express yourselves to the web. Currently, they are providing the hosting platform to more than 29 Million users in 178 countries. With an average of 15,000 new sign-ups on their website, making it a new user every five seconds. They have developed a strong structure with use of powerful technology.